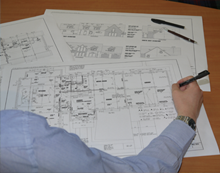 With our unique and bespoke design and build option, we provide a complete service from inception to handing over the keys to your new home. With our hugely experienced design and construction teams we are able to ensure every aspect of your home is to your liking. Each of the house types from our range can be built as they appear on plan, or they can be customised to your individual requirements. However, if you don’t find exactly what you are looking for we are happy to sit down with you and design your perfect home from scratch. Don’t hesitate, let Caledonia Homes be the ones to help you turn the House of Your Dreams into a Reality! ©2014 Caledonia Homes (Scotland) Ltd.